This vest is worked in one piece to the armholes then separated to work the fronts and back separately. The hood is worked by picking up stitches after the shoulders are sewn together. 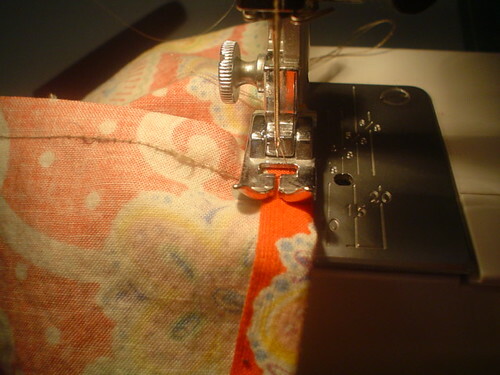 The zipper can be sewn in either by hand or machine. I prefer to put it in by machine, much faster! Change to stockinette stitch, knit on the right side (RS), purl on the wrong side (WS), continue until piece measures between 14” and 16”. You have the choice to make it as long or as short as you want. The pagoda vest is 14” to the underarm and the olive vest is 16” to the underarm. I like them equally. 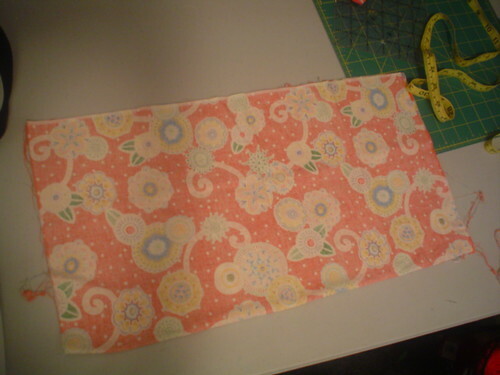 Now you will be binding off for the underarms and working the fronts and back separately. Turn your work and continue working stockinette over the 20(22)sts for 5”. On next WS row, BO 4sts, purl to end. Turn and knit to end. Turn, BO 3sts, purl to end. Turn, BO 2sts, purl to end. Turn, BO 1 st, purl to end. Work a further 13 rows and BO all sts. Join yarn on RS of panel. Knit 5” of stockinette over the 20(22)sts as you did for the left front. On next RS row, BO 4sts, knit to end. Turn and purl to end. Turn, BO 3sts, knit to end. Turn, BO 2sts, knit to end. Turn, BO 1 st, knit to end. Join yarn on RS of back. Knit in stockinette until the back is the same length as the fronts, measuring from BO underarm sts. Sew shoulder seams together; front panels to back piece matching at armhole and seaming in towards the neckline. (WS) p2, k2 across, end with p2. (RS) k2, p2 across, end with k2. BO 6sts, work 12 sts, M1, p2, M1, work 14(18)sts, M1, p2, k2, p2, M1, work 14(18)sts, M1, p2, M1, work 18sts. Turn, BO 6sts, work across knitting all k sts and purling all p sts. Continue until hood measures 13”, ending with a WS row. Work a 3 needle BO with RS held together, WS facing out. Join yarn at base of armhole, PU 68sts, join in the round. Work k2, p2 ribbing for 2 rows. Soak or wash the vest before sewing in the zipper. 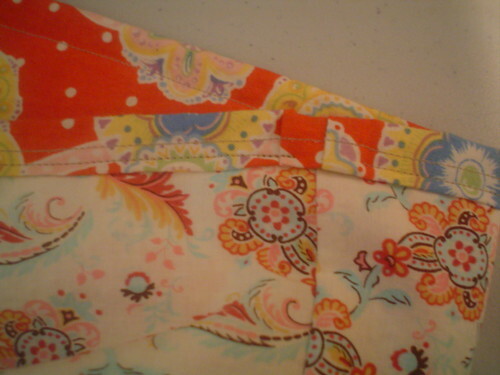 Either hand or machine sew in a separating zipper. You’re finished!! Wear & Enjoy!! Since so many people liked my simple little bag I thought I would do a little tutorial. 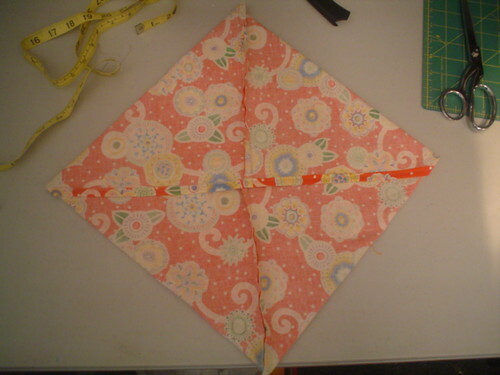 Take one fat quarter and fold it in half, right sides together, so it measures 10.5″ x 19.5″. Square off sides for a more precise sewing edge if you wish. Sew 2 seams, one down each side. 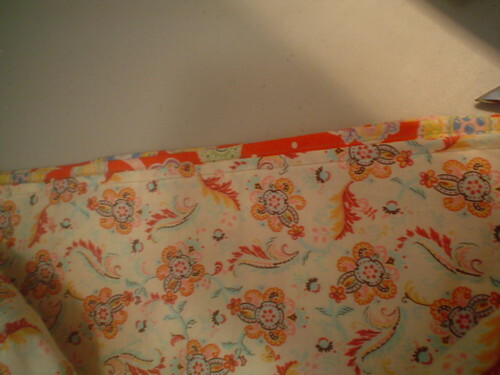 Turn the top edge down and sew with 3/8″ seam allowance (one side should be the selvedge edge and that is the side I start with for a beginning clean edge). 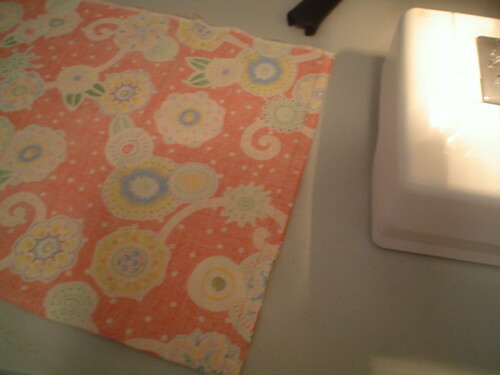 Next I fold the fat quarter into a diamond shape to make the corners for the square bottom. 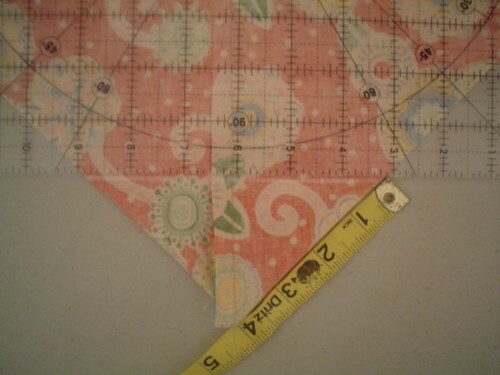 Measure up each side of the triangle corner 4″, using a straight edge mark a line across for sewing. 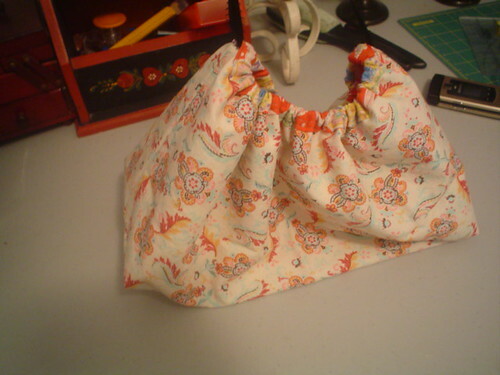 Sew a straight line across, do not cut off the excess fabric triangle, it adds stability to the bottom of the bag. Repeat on both corners. Now you are ready to do the same thing to the second fat quarter. 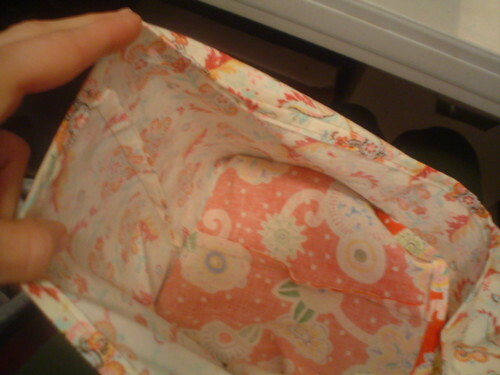 Once you have both fat quarters done you are going to fit one inside the other, wrong sides together and corner triangles of fabric to the bottom of the bag, matching the corner triangle seams inside. fold that over for your ribbon band. 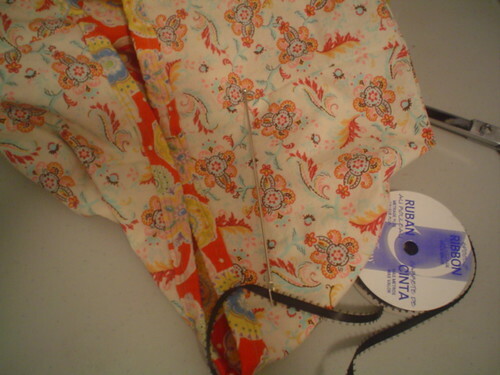 Sew down using 5/8″ seam allowance, leaving 1/2″ openings at each side seam for you to pull your ribbons through. 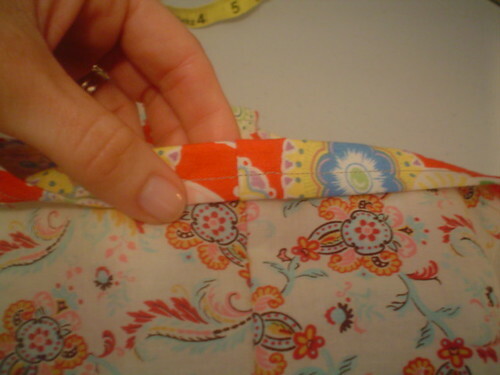 You may have to fold over a little pleat to take away the excess fold-over fabric. Note: If you are going to use a larger ribbon you will need to fold down more for the ribbon to be able to fit through. Starting at one side, draw ribbon through, all the way around coming out the side where you started. Repeat through the other side. Tie ends and you are done! 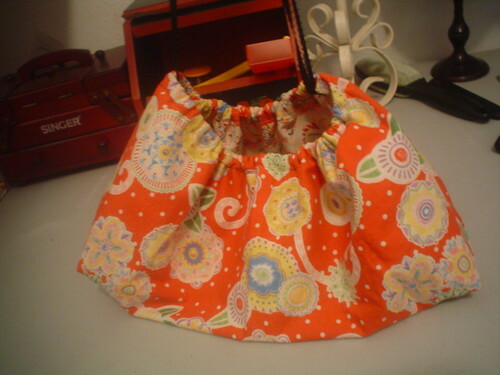 You now have a drawstring, reversible project bag!! I hope by this point you see the pattern emerging. I usually go to Rnd 13 for a mans hat, Rnd 11 for a youth or womens hat, Rnd 10 for a childs hat, Rnd 9 for a toddler hat and Rnd 8 for a baby hat. This is more of a guideline pattern, you can make your first hat and then adjust the crown rounds to your desired size adding increases if needed by doing more rounds in the set pattern. Using long tail cast on, cast on very loosely 36 (40). – Join in the round being very careful not to twist. Continue working those 2 rows until flap measures 2 2/3 inches long. End with a knit row. – Gusset: move half heel sts to new needle (N1). PU 15 sts down side with N1 (already has 1/2 heel flap sts). N2- Knit across instep sts. Using 4th needle, PU 14sts along heel flap side. Transfer to N3 (already has 1/2 heel flap sts). Next round start gussett decreases. Start of round (row) is now center of heel. – Continue in stockinette st until foot measures 7 (7.5) inches from back of heel. -Repeat last 2* rounds until 16 (20) sts remain. – Now you have 8 (10) sts on N2 and 8 (10) sts on N3. Graft together with kitchener stitch. Repeat those 2 rows until heel flap measures 2 2/3”- 3”. End with a purl row. With MC cast on 70 (80, 90). Separate the sts in half and pull needle cord through for magic loop. Moving front sts down to needle tip, have back half with yarn tail & working yarn on back cord, leave a loop on the left side. Repeat in this sequence of decreasing until you have about 5 sts left, cut yarn & draw through all sts, pull tight and weave in ends. Cast on 44 sts, separate in half onto the 2 needle points. Join in the round and start 2×2 rib or seed stitch. Continue ribbing for 1 inch. Start stockinette stitch, work until hat measures 3.5 inches. *k10, k2tog* rep from * to * around. *k9, k2tog* rep from *to* around. *k8, k2tog* rep from *to* around. Continue decreasing in this manner until you have 8 sts left. Cut yarn and draw through remaining sts, pull tight to close. Finished size after blocking: 72″ long by 8″ wide. When the pattern says sl2, you will slip 2 sts together from the left hand needle to the right hand needle. The flames will undulate between 3 and 2 across naturally in the stitch pattern without casting on anymore sts. That is how you get the wavy edge, the stitch pattern does it for you. You will knit this in 2 halves and kitchener graft them together at the center. Repeat rows 21-40until piece measures the desired length of half of your scarf, ending with row 40. Put stitches on holder or spare needle for grafting later. Work as for first half ending with row 40 at equal length as the first half. Using kitchener stitch or 3 needle bind off, graft two sides together. Tie in any loose ends & block! Here it is half blocked. You can see the difference between the blocked (on the top of photo) and the unblocked sides. Here is a closeup of the kitchener stitch join of the two halves on the backside. double decrease- Sl 2 knitwise together, k1, pass 2 slsts over k1. double increase- (k1,yo,k1) all in the same st.
Row 1- k1, ssk, *k9, double dec: rep from*, end k9, k2tog, k1. Row 2- k2, *k4, double inc, k4, p1;rep from *, end k1. Following pattern stitch rows above start with row 1, follow pattern rows until bracelet measures desired height. End with row 2. Bind off, knitting all stitches across as you bind off. Do not bind off in pattern. Sew on 2 small buttons that will slide through the edge garter stitches. If you wanted, you could add a watch face similar to the Boogie time watch/bracelet on knitty.com.